The 51.82 metre motor yacht Dionea has been listed for sale by Tomaso Polli at Edmiston & Company. Originally built as a ferry by Italian yard Felszegi with delivery in 1962, she was sympathetically converted to an outstanding luxury in 2003 by T Mariotti and has proved to be a very successful charter yacht. Her interior, designed by Ivana Porfiri, blends olde worlde charm with all the most modern materials and amenities, accommodating 12 guests in six cabins. These consist of a master suite, VIP suite, two doubles and two twins, all with entertainment centres, satellite television screens and en suite shower facilities. In addition, there are quarters for nine crew. Her exceptionally comfortable interior is highlighted with mahogany panelling and the original portholes – adding a distinct touch of classic charm – while her modern technology and leisure facilities ensure she impresses all who step on board. Deck spaces are massive, reflecting her past as a ferry, and can easily accept 120 guests for cocktail receptions, should her new owners wish to continue her proud reputation as a charter yacht. The aft deck offers dining facilities for 12 guests while the sun deck has sun loungers and a long table, also seating 12 guests, and there is a large Bimini top offering protection from the sun. Twin 720hp Caterpillar diesel engines give her a cruising speed of 12 knots and she is fitted with zero speed stabilisers to offset roll motion at sea and in port. 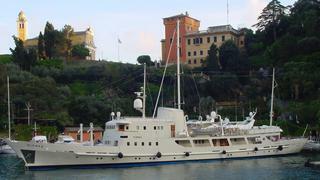 Lying in Genoa, Italy, Dionea is asking €4,950,000.